Alpine strawberries, now grown worldwide, originated from this wild strawberry and have smaller, more aromatic fruits than "cultivated" strawberries (which were developed in the 18th century from an American hybrid). 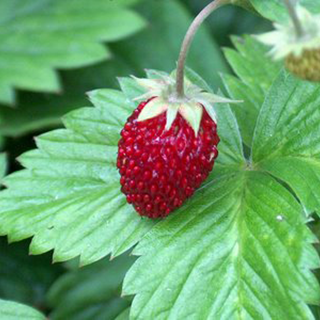 Wild strawberry is found in woodlands and grassy areas of Europe, western Asia, and North America. Its leaves and fruits are used medicinally, mainly in astringent teas. Drink 1 cup (2 tsp herb per cup of boiled water) of the leaves 3 times daily for diarrhea. Use 1 cup of the above infusion of the leaves for sore throats and gum disease. Use the above infusion of the leaves as a lotion to bathe minor burns, cuts, and grazes. Traditionally regarded as cooling, strawberries have, in the past, been prescribed for gout, arthritis, rheumatism, and tuberculosis. They can also be soothing for gastritis and in convalescence. Juice some fresh berries and take in 2 tsp (10ml) doses 3 times daily to combat infections and as a mild, cleansing laxative in constipation and arthritic disorders. The crushed fresh berries can be used as a poultice to soothe sunburn and skin inflammations. Prefers moist but well-drained fertile soil that is rich in organic matter, in sun or partial shade. Propagate by sowing seeds in trays in spring or autumn and lightly covering them with soil. Keep moist and transplant to 3in (7.5cm) pots when large enough to handle. Alternatively, grow from rooted stolons (horizontal shoots) separated from the mother plant in late summer. It can be grown as an edging plant in a herb garden. Collect the fruit as it ripens in the summer and gather the leaves throughout the growing period.